Paperback: 160 pages. 300 color photos. Dimensions: 8-1/4 in. x 10-5/8 in. I’m usually not a big fan of this form of “do-it-all” compendium. It typically tries to cover everything and ends up covering nothing. So I sighed when I saw that the first word on the cover of the book was “Everything”. 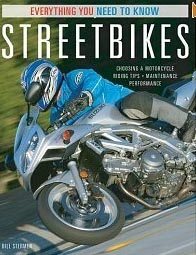 How could a single book cover “Everything You Need To Know” about Streetbikes? But then I discovered that the author is the well-respected Bill Stermer, who is (or should be) a familiar name to motorcyclists. Stermer has been involved with motorcycles about as long as I have, back in the 1960’s. He started his motorcycle journalist career in 1978 with the late and lamented Cycle magazine. Stermer notes that 1978 was the year that Honda also introduced the CBX six cylinder motorcycle, which I thought was the end of motorcycling as we knew it*. Stermer realized that he was well positioned to distill his over 40 years’ experience in motorcycling to the many new riders who have been entering the sport over the last few years. So he set out to write a book that would cover — you got it — everything a new rider might need to know about riding on the street. The difficulty in tackling this would be to first ensure that everything of importance is indeed covered while it is succinct enough to keep the reader’s interest. I can tell you that Stermer has been surprising successful in doing just that. My skepticism quickly faded as I read the book with a newcomer’s eyes and realized that, believe it or not, he really has covered just about everything necessary in a brisk but informative style. The book is loaded with color photos (300 claimed, although I didn’t count them all!) and illustrations, which help the cause. My feeling is that the Internet and website page formats have actually caused book publishers to rethink their normally turgid formats and layouts. And this book uses what seems to be the new style for interest books that makes the reading experience both pleasant and efficient. I’m a big believer in the “Navy way” of education; that is, “tell them what you’re going to teach them; teach them; then tell them what you just taught them”, having been a part-time instructor in the Reserve. Stermer uses a similar method in this book; at the beginning of each chapter is a box entitled “What You Will Learn”, and I found that it really helps focus the reader on the subjects at hand. I honestly think that a complete beginner could read this book and actually be conversant when talking to more experienced motorcyclists, their local motorcycle dealer or even on Internet-based motorcycle message boards or email lists. The book covers everything from details about chassis and engine information to accessories, basic maintenance, safety and apparel and even sidecars, trailers and trikes. The real trick in covering all of this is to go beyond the very basics but without overwhelming the target audience, and Stermer has demonstrated he has the gift to do just that. The only nitpick I might have with Stermer’s book? I don’t think it pays quite as much attention to the issue of training as it should or could. I would have liked to see the training issue addressed as the very first chapter. As many of you know, motorcycle accidents and deaths have been greatly increasing with the increase in popularity of the sport, and this is something that we all very much need to pay attention to and to address. The other issue that may be problematic is that although the information should be valid for many years to come, the photos will probably become stale very quickly. That’s due to the speed of evolution in both motorcycle hardware and “software”, the clothing and accessories that are seemingly updated quarterly by the manufacturers. But overall, I think that Streetbikes – Everything You Need To Know is an excellent guide for those who are new to the sport. It hits the demographic perfectly and should be the first stop that any prospective motorcyclist makes on their way to what should be their continuous improvement strategy for education about the sport. New and prospective riders should also visit the wBW Motorcycle Book Reviews index to choose books about motorcycle riding skills. Excellent suggestions include David Hough’s Proficient Motorcycling (review), Pat Hahn’s Ride Hard, Ride Smart (review) and Sport Riding Techniques(review) by Nick Ienatch, among others.